Contact: Opticron, Unit 21, Titan Court, Laporte Way, Luton, Bedfordshire, LU4 8EF, UK, tel: 01582 726 522 (Mon-Fri 9am-5pm). As well as the 8x42 and 10x42 models, there are also compact 8x25 and 10x25 bins in the new Trailfinder range. Looking at the 8x25s alongside their bigger brothers, I was impressed that they largely replicated their performance. OK, so the field of view comes down to 119m@1,000m, but they still produced a bright image, for this size of binocular, and the focusing and sharpness were excellent. Eye relief is still good (16mm), and the eyecups twist up and down to four positions, while close focus felt more like 1m than the quoted 1.5m. If you’re in the market for some bins to slip into your coat pocket for casual birding, these are well worth a look. A sticker on these compact, solid, smart (they come in black or green) binoculars announces that they’re recommended by The Urban Birder, which raised the intriguing possibility of having to argue the toss about their merits with our own David Lindo. So, is our star columnist right? Well, they’re an upgrade of the Trailfinder IIs, and they make an excellent first impression, showing off good light-gathering qualities and producing a bright, sharp image. It takes you a moment or two to remember that you’re not looking through ED glass. The colour of the image looks pretty natural too – maybe just a shade on the yellowish, warm side? There’s a certain amount of milkiness around the edge of the image, too, but really not enough to put you off – we’re talking about a good sweet spot here. What was really impressive was how well they coped with different light. Early-morning expeditions in unseasonal August drizzle were no problem, while they did well when viewing against really strong light, too, with only a little colour fringing showing up. In fairly average light, it was barely noticeable. The field of view felt good, too, even with that little bit of fall-off towards the edges – scanning flocks and following scurrying waders never felt difficult. The focusing was satisfyingly precise, too, with the focus wheel (ridged, and just a little over one finger wide) travelling very smoothly and just a bit stiffly, taking exactly one anti-clockwise turn from close focus to infinity. Close focus is excellent, too, pulling in to around 1.5m. The rest of the build quality matches that of the focus system. The twist-up eyecups offered plenty of eye relief when fully out (there are two positions, although I did try them around halfway and they stayed in place well), and they’re nicely rounded on the edges to make them comfortable in extended use. The dioptre adjustment, on the right barrel, twists stiffly into place and won’t be budged accidentally, and I liked the feel of them in my hands – easy to grip and well-balanced, and certainly not heavy. The rainguard was functional, as was the strap, and there’s a soft case included too. 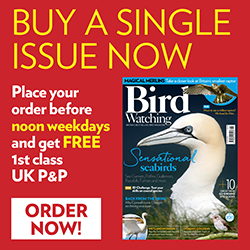 All in all, they look and perform like a much more expensive pair of binoculars (they’re priced at £129), making them a great buy for first-timers or anyone looking to move up a little from their entry-level bins, or for birders looking for a second pair to keep to hand in the kitchen. That’s a reflection of how optical technology has filtered down to the ‘budget’ end of the market in recent years, but it’s also down to Opticron’s long record of producing user-friendly, reliable, high-performing binoculars.